Electronic cigarettes, or e-cigarettes, are growing in popularity. How should employers handle this? Cigarette smoke contains more than 4,700 chemical compounds, which can affect anyone within breathing distance of the smoker. Many states and municipalities have laws banning or restricting smoking in the workplace to prevent exposure to the chemicals in this second-hand smoke. E-cigarettes do not produce smoke. Instead of tobacco, they contain liquid nicotine (plus flavorings and other substances), which the device turns into a vapor. Since e-cigarettes contain no tobacco, federal and state tobacco laws do not apply. Despite their lack of tobacco, e-cigarettes still raise health concerns. A study led by Maciej Goniewicz, a researcher and assistant professor of oncology in Roswell Park Cancer Institute, found that vapors released from e-cigarettes into surrounding air do contain nicotine. “Our data suggest that secondhand exposure to nicotine from e-cigarettes is on average 10 times less than from tobacco smoke. However, more research is needed to evaluate the health consequences of secondhand exposure to nicotine from e-cigarettes, especially among vulnerable populations including children, pregnant women and people with cardiovascular conditions,” he said. The study, one of the first on the safety of e-cigarettes, had several limitations. It focused on nicotine and a limited number of other chemicals released from e-cigarettes. 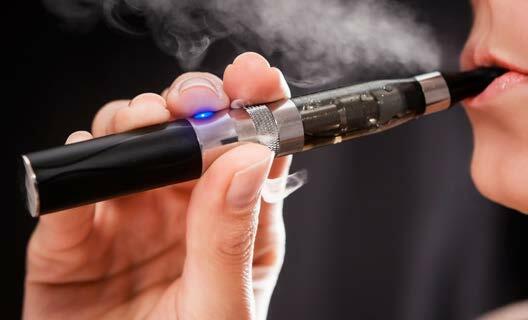 Researchers noted that future research “should explore emissions and exposures to other toxins and compounds identified in e-cigarettes such as formaldehyde, acetaldehyde and acrolein.” In addition, more research is needed to determine whether vapor from e-cigarettes can deposit onto surfaces to create “third-hand” vapor. Proponents of e-cigarettes say they are safer than cigarettes and help smokers quit. Although anecdotal evidence suggests e-cigarettes have helped some smokers quit, many health officials aren’t so sure. The FDA opposes the products, saying that e-cigarettes “may contain ingredients that are known to be toxic to humans.” And because e-cigarettes are not regulated, there is no way to know how much nicotine—an addictive drug—they deliver. Public and health policy regarding e-cigarettes is still evolving, pending further research. Some employers that ban smoking allow the use of e-cigarettes in the workplace. Others, fearful of the health effects of e-cigarette use and of secondhand vapors, have banned them. And many will turn a blind eye until a fellow employee complains. What you decide to do should depend on state and local laws and your company’s culture. Some states—Alabama, Idaho, Georgia, Missouri, New Hampshire and Oklahoma—allow smoking only in a designated location. California and Connecticut allow smoking only in specified areas with adequate ventilation. Some states have no restrictions on smoking in the workplace: Alaska, Indiana, Kentucky, Mississippi, North Carolina, South Carolina, Texas, Virginia, West Virginia and Wyoming. If you have operations in these states, you’ll want to check with the local health department or chamber of commerce, since some municipalities within these states have placed stronger restrictions on smoking within their boundaries. The remaining states prohibit smoking in all, or nearly all, workplaces. The Affordable Care Act allows health insurers to charge tobacco users up to 50 percent more than non-users, although some states have indicated they will not let insurers surcharge tobacco users within their borders. The surcharges may not apply to e-cigarettes. However, if your employees buy individual life or health policies, they may have to submit to a blood test. E-cigarette users will have nicotine in their blood, which could cause insurance underwriters to flag them as smokers or nicotine users. A very informal survey of several leading life and health insurers indicated that many charge higher rates for e-cigarette users. What about wellness programs? As mentioned earlier, e-cigarette manufacturers say the devices can help smokers quit. However, no studies have examined the effectiveness of e-cigarettes in getting former smokers to quit the nicotine habit. Further research should also focus on the effects of secondhand exposure to e-cigarette vapors—can nicotine in e-cigarette vapors reinforce nicotine addiction? What other health effects does secondhand exposure pose? Contact USI for information on wellness programs, including smoking cessation programs, and for suggestions on dealing with this and other health concerns in your workplace.